Kaplan International Colleges are pleased to announce the opening of a new junior English language school in Edinburgh in time for the summer. The school will offer Kaplan English courses for teenagers. 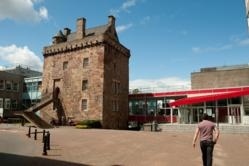 Kaplan’s new language school is situated in the Napier University campus. It will be open to students between June 23rd and August 10th and will provide them with an opportunity to experience the Scottish capital with evening activities, day trips, sports and sightseeing. The school is ten minutes away from the city center where students will be able to enjoy world-class festivals and amazing scenery. Anna Robinson, Kaplan's Junior Operations Manager for the UK & Ireland, said: “Kaplan is delighted to add our Edinburgh Kaplan International Center as one of our UK junior programme centers. Kaplan has been voted ‘best educator in Scotland’ and this reputation for outstanding education and care is now available for 14-17 year olds on all inclusive Junior Programmes." Kaplan will be expanding its existing junior programmes in the UK by also opening a new school in Brighton in time for Summer 2013. The school will add to Kaplan’s existing destinations in Bath, Bournemouth, London Kingston, Salisbury and Torquay. .